LOGANSPORT, Ind. — Downtown Logansport is set to welcome the second annual Med Flory Jazz and Blues Festival this Friday and Saturday, May 15 and 16. Twelve bands from throughout Indiana will play over the two-day period. The lineup includes swing, bebop, big band, R&B, funk, blues ragtime, Chicago blues, vocal jazz and New Orleans jazz. Grammy award winner and Logansport native, Med Flory. 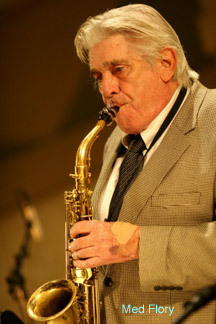 The festival honors the legacy of the Grammy-award winning entertainer and Logansport native Med Flory and is a celebration of his artistic contributions and of America’s original art form, jazz music. Attendees are encouraged to celebrate the jazz age by dressing in 1920s style clothing. Modern clothes are fine, also. Food, wine and beer will be available. The two-day festival kicks off Friday, May 15 with a New-Orleans-style parade led by grand marshal and longtime Logansport High School music teacher Joe Huffman. The parade starts at LMU Park at 5:30 p.m. and is scheduled to arrive at the festival grounds about 5:45 p.m. Med Flory was initially scheduled to participate in this year’s festival, but due to some health problems, will not be attending. We hope he’ll be back with us next year. While our thoughts and prayers are with Med, we still have a full weekend of music to look forward to — and we believe Med wouldn’t want it any other way! Friday night’s entertainment lineup begins at 6 p.m. Lisa Terry will be the emcee on Friday night. The second session is scheduled to begin at 3 p.m. on Saturday. Dave Kitchell will be the emcee at the Saturday night session. Advance tickets for the Med Flory Jazz and Blues Festival are $13 per session and $22 for the weekend. Day-of-show tickets are $16 per session and $28 for the weekend. Student tickets are $5 per session any time. A late night ticket will be available both nights at the gate for $5. Tickets are available at Minglin Jewelers, Security Federal Savings Bank, Susan’s Corner Cupboard and Arnold’s Fine Jewelry and Gifts in Logansport. Tickets can be purchased online at www.floryfest.org or by calling the Cass County Arts Alliance at (574) 735-ARTS. The Med Flory Jazz & Blues Festival is presented by the Cass County Arts Alliance, thanks to financial contributions by our corporate sponsors: Security Federal Savings Bank, The Andersons, the Cass County Community Foundation, and the Cass County Visitor’s Bureau. Associate Sponsors are The Care Group and Mid-America Radio, and our Tent Sponsors are American Party Time, Burkhart Advertising, Logansport MaraMart, and Woodbridge Health Campus. For more information about the festival, visit www.floryfest.org or contact the Cass County Arts Alliance at 574-735-ARTS (2787) or e-mail at info@floryfest.org. The Cass County Arts Alliance is a member of the Tippecanoe Arts Federation. WEST LAFAYETTE, Ind. — West Lafayette police are investigating report that a male student was attacked about 1:30 a.m. Monday (May 11) near the Purdue University West Lafayette campus. The victim reported he had been hit in the head in the 100 block of Andrew Place. Police caution the public to be alert and report any information to West Lafayette Police at 765-772-5200. WEST LAFAYETTE, Ind. — Purdue University police on Sunday (May 10) arrested a man on several charges, including the attempted theft of a dog sculpture that is part of the Dog Days of Summer community art project. Police also recovered one of two sculptures previously reported stolen. Adam Sachs, 20, a sophomore in the College of Engineering from St. Louis, was taken to Tippecanoe County Jail on preliminary charges of public intoxication, consumption of alcohol by a minor, criminal mischief and attempted theft. According to a police report, an officer saw Sachs shortly before 3:30 a.m. attempting to steal the dog sculpture “El Perro” that was located on campus near the intersection of Grant Street and Northwestern Avenue. Sachs was carrying a toolbox with him when he was arrested, according to the report. The statue was not damaged. In addition to Sunday’s attempted theft, two of the 41 dog sculptures decorated by area artists as part of the art project were stolen late Friday (May 8) or early Saturday (May 9). Police do not believe Sachs was involved in the previous thefts. On Sunday afternoon, police recovered one of those sculptures – “Give a Dog a Bone, an X-RAY View” by artist Liz Rainey. A passerby called police after spotting the artwork behind foliage outside the Purdue School of Veterinary Medicine’s Lynn Hall, near the location from which the dog was originally taken. Nicknamed “Oliver” by students, the sculpture was sponsored through contributions from students, faculty and staff in honor of the School of Veterinary Medicine’s 50th anniversary. Police are still attempting to find the final missing dog. “Alfie the Alpha Dog,” decorated by artist Janet Combs Ivas, was taken from the Northwestern Avenue side of the West Lafayette Public Library. Doerr said a reward of up to $250 was being offered for its safe return. Anyone with information related to the thefts is asked to contact Purdue police at 765-494-8221 or the anonymous tip line at 765-496-3784. The School of Veterinary Medicine and the Art Museum of Greater Lafayette partnered on the project that placed decorated life-size dog statues throughout Lafayette and West Lafayette. In addition to celebrating the 50th anniversary of the school, the project also is a tribute to the 100th anniversary of the Art Museum of Greater Lafayette and benefits both equally. The Dog Days of Summer builds upon previous sculpture projects in the community: Hog Wild in 2003 and Frog Follies in 2005. This new project was inspired by the School of Veterinary Medicine’s outdoor sculpture “Continuum” by Larry Anderson, which features a dog as part of its array of people and animals in a depiction of the enduring human-animal bond. 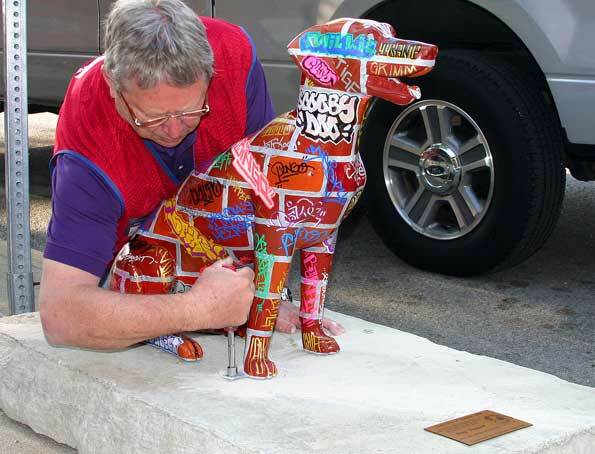 Artists from Indiana and other areas were recruited to decorate three-dimensional dog forms. Corporations, business owners, veterinarians and individuals have sponsored the individual dogs. Proceeds from the project will benefit the School of Veterinary Medicine’s 50th Anniversary Scholarship Endowment and its Good Samaritan Fund, and the Art Museum of Greater Lafayette’s art education programs. WEST LAFAYETTE, Ind. — Two of the 41 dog sculptures decorated by area artists as part of the Dog Days of Summer community art project were stolen late Friday (May 8) or early Saturday (May 9). One called “Give a Dog a Bone” by artist Liz Rainey was sponsored through contributions from students, faculty and staff in Purdue University’s School of Veterinary Medicine in honor of the school’s 50th anniversary. Nicknamed “Oliver” by the students, it is missing from the Harrison Street side of Lynn Hall, the school’s home on Harrison Street on the south side of campus. The second missing sculpture, “Alfie the Alpha Dog,” was decorated by artist Janet Combs Ivas and had been standing watch on the Northwestern Avenue side of the West Lafayette Public Library. “These dogs are priceless, not just because of the imagination and talent that went into producing them but also because of the community spirit they represent,” said Kevin Doerr, the school’s director of alumni relations and public affairs. “Our students, faculty and staff are enormously disappointed since this was a highlight of our anniversary celebration. In addition to celebrating the 50th anniversary of the school, the project also is a tribute to the 100th anniversary of the Art Museum of Greater Lafayette, and both benefit equally. The Dog Days of Summer builds upon previous sculpture projects in the community: Hog Wild in 2003 and Frog Follies in 2005. This new project was inspired by the School of Veterinary Medicine’s outdoor sculpture “Continuum” by Larry Anderson, which features a dog as part of its array of people and animals in a depiction of the enduring human-animal bond. Artists from Indiana and other areas were recruited to decorate three-dimensional fiberglass dog forms. The finished dogs will be on display from May through September. Corporations, business owners, veterinarians and individuals have sponsored the individual dogs, which will go home with them when Dog Days are over. At the end of the exhibition, a few of the decorated dogs will go on the road as part of the School of Veterinary Medicine’s traveling exhibit in celebration of its 50th anniversary. Other dogs will be auctioned off to the public on Oct. 4, when they will find a permanent home. Proceeds from the project will benefit the School of Veterinary Medicine’s 50th Anniversary Scholarship Endowment and its Good Samaritan Fund, and the Art Museum of Greater Lafayette’s art education programs. LAFAYETTE, Ind. — Two area grade schools were put on lockdown today (May 7) after receiving a complaint of a possible threat to the school. 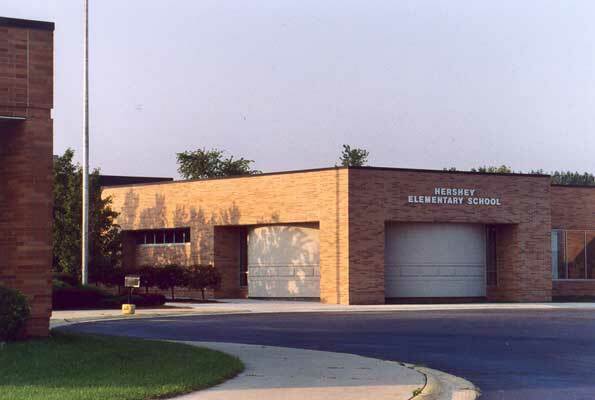 On Thursday, May 7, 2009 at around 8:50a, Tippecanoe County Sheriff’s Deputies were dispatched to Hershey Elementary School after a student’s mother informed them that the student’s non-custodial father was going to try to remove the children from the school and that he might possibly be armed with a handgun. 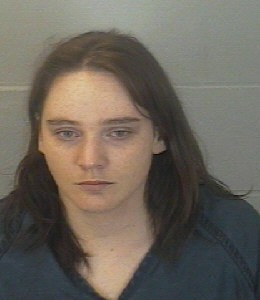 Melissa Paxton, 33, of Lafayette was arrested and charged with False Informing. As a precaution both Hershey Elementary School and the adjacent East Tipp Middle School were placed on lockdown while the investigation was pending. After approximately three (3) hours, the father, Richard Wireman (42) of Lafayette, was located in Plymouth, Indiana. He was arrested on an unrelated civil attachment (79D03-0207-JP-135) and is currently being held on a $1000.00 bond in the Marshall County Jail. When detectives determined that Wireman had not been in the Lafayette area, the custodial mother, Melissa Paxton (33) of Lafayette, was arrested for False Informing as a Class a Misdemeanor and is she is currently being held in the Tippecanoe County Jail on a $250.00 cash bond. The investigation was conducted by Detective Sergeant James D. Caldwell and Detective Thomas Lehman.